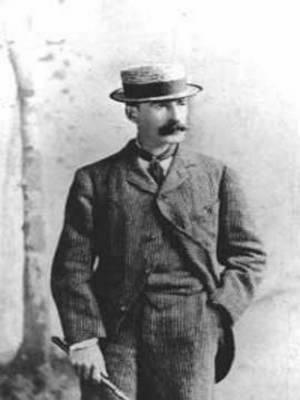 Winslow Homer (February 24, 1836 – September 29, 1910) was an American landscape painter and printmaker, best known for his marine subjects. 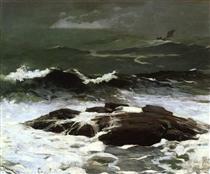 He is considered one of the foremost painters in 19th-century America and a preeminent figure in American art. Largely self-taught, Homer began his career working as a commercial illustrator. He subsequently took up oil painting and produced major studio works characterized by the weight and density he exploited from the medium. He also worked extensively in watercolor, creating a fluid and prolific oeuvre, primarily chronicling his working vacations. Born in Boston, Massachusetts, in 1836, Homer was the second of three sons of Charles Savage Homer and Henrietta Benson Homer, both from long lines of New Englanders. His mother was a gifted amateur watercolorist and Homer's first teacher. She and her son had a close relationship throughout their lives. 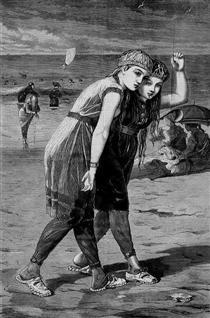 Homer took on many of her traits, including her quiet, strong-willed, terse, sociable nature; her dry sense of humor; and her artistic talent. Homer had a happy childhood, growing up mostly in then rural Cambridge, Massachusetts. He was an average student, but his art talent was evident in his early years. Homer's father was a volatile, restless businessman who was always looking to "make a killing". When Homer was thirteen, Charles gave up the hardware store business to seek a fortune in the California gold rush. When that failed, Charles left his family and went to Europe to raise capital for other get-rich-quick schemes that didn't materialize. After Homer's high school graduation, his father saw a newspaper advertisement and arranged for an apprenticeship. Homer's apprenticeship at the age of 19 to J. H. Bufford, a Boston commercial lithographer, was a formative but "treadmill experience". He worked repetitively on sheet music covers and other commercial work for two years. By 1857, his freelance career was underway after he turned down an offer to join the staff of Harper's Weekly. "From the time I took my nose off that lithographic stone", Homer later stated, "I have had no master, and never shall have any." Homer's career as an illustrator lasted nearly twenty years. He contributed illustrations of Boston life and rural New England life to magazines such as Ballou's Pictorial and Harper's Weekly at a time when the market for illustrations was growing rapidly and fads and fashions were changing quickly. His early works, mostly commercial engravings of urban and country social scenes, are characterized by clean outlines, simplified forms, dramatic contrast of light and dark, and lively figure groupings—qualities that remained important throughout his career. His quick success was mostly due to this strong understanding of graphic design and also to the adaptability of his designs to wood engraving. Before moving to New York in 1859, Homer lived in Belmont, Massachusetts with his family. His uncle's Belmont mansion, the 1853 Homer House, was the inspiration for a number of his early illustrations and paintings, including several of his 1860s croquet pictures. The Homer House, owned by the Belmont Woman's Club, is open for public tours. In 1859, he opened a studio in the Tenth Street Studio Building in New York City, the artistic and publishing capital of the United States. Until 1863, he attended classes at the National Academy of Design, and studied briefly with Frédéric Rondel, who taught him the basics of painting. In only about a year of self-training, Homer was producing excellent oil work. His mother tried to raise family funds to send him to Europe for further study but instead Harper's sent Homer to the front lines of the American Civil War (1861–1865), where he sketched battle scenes and camp life, the quiet moments as well as the chaotic ones. His initial sketches were of the camp, commanders, and army of the famous Union officer, Major General George B. McClellan, at the banks of the Potomac River in October 1861. Camp Fire Winslow Homer ? 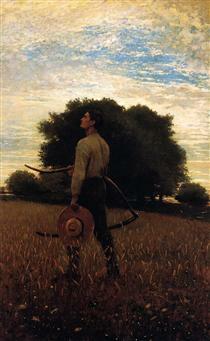 Song of the Lark (also known as In the Field) Winslow Homer ?